Give your garden an edge with this too-cool 20" Biker Garden Gnome! Unlike other gnomes, this guy's got attitude to spare and a totally funky outfit to match. You'll get a kick out of his cool chaps, vest, sunglasses and biker gloves. Despite this intimidating apparel, our biker gnome still sports the cute gray beard that makes any gnome irresistibly charming. 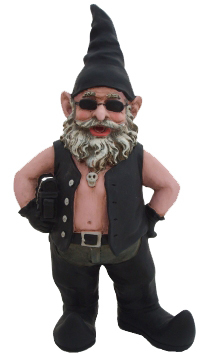 We love that our biker gnome offers you the chance to get some yard art that meets your unique hobbies and lifestyle. Plus, this Biker Garden Gnome is made from cast stone resin for a durable, all-weather design. At 21" tall, he's also the perfect size for placing anywhere outdoors, from your garden to your front door.